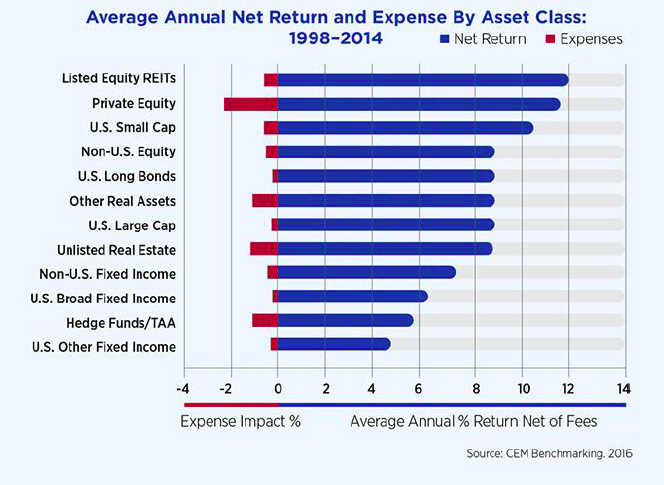 A study by CEM Benchmarking found that hedge funds provide the lowest net annual returns to US pension funds among all asset classes. With an average compound return of 5 percent, only cash provided lower return figures. Hedge funds provided lower average net annual returns to U.S. pension funds than any asset class except cash, according to a report analyzing $8.4 trillion in defined-benefit plans from 1998 through 2014. “If cash is excluded as an asset class, then hedge funds must be considered the worst performing,” with an average compound return of about 5 percent, according to the study of retirement-plan assets by CEM Benchmarking, a Toronto-based consultant for institutional investors. Pension funds from New York City to Orange County, California, are weighing exiting hedge fund investments. Vicki Fuller, chief investment officer of the New York State Common Retirement Fund, the country’s third-biggest pension fund, said in June that hedge funds should face performance hurdles to earn their traditional “2 and 20” fees, or 2 percent of assets and 20 percent of gains. The California Public Employees’ Retirement System, the largest U.S. pension fund, divested its $4 billion hedge fund portfolio in 2014, saying the asset class was too expensive and complex. The same study found that publicly traded real estate investment trusts (REITs) and private equity produced the highest annual net returns for pension funds.